The Invacare Action3 has been designed to enable easier assessment, and adjusts for maximum mobility. The Action 3 manoeuvres smoothly due to its light rigid and well-balanced frame, and an ergonomic design that enables the user to become more independent. Performance – The Invacare Action3 is designed to ensure optimal driving performance with the lightweight rigid frame and high quality components providing easy rolling and manoeuvrability. Easily transportable – Simple to fold and dismantle with a low transfer weight, the Action 3 can be transported in a small car. Active, standard, medium and amputee positions. Invacare Action3 offers as standard the possibility of increased driving performance with a choice of 20 different rear wheel positions. The rear wheel can be positioned in a standard or medium position, or in either the active or amputee position to suit the user need. Easy angle adjustment – Action3 offers rapid and easy assessment. 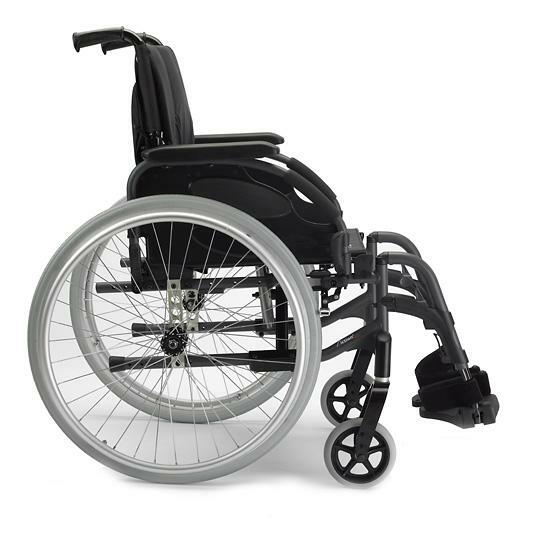 The wheelchair is supplied as standard with a 3° seat angle that is adjustable to a seat angle of 6° for the active user, or 0 degree for the hemiplegic user, which allows for foot propulsion..
Quick release Leg rests – The swing in/swing out leg rest is equipped with an easily operated, quick release mechanism. The height of the leg rest can be adjusted in steps of 1 cm with two different inner tubes to meet low and high seat height requirements. Smooth new head support fixation with no flushing. 14.5kg weight – The total weight of 14.5kg addresses the need for improved handling, storage and transportation. Transportation weight (without legrest and rearwheel) is 9kg. Length compensating Leg Support – The elevating legrests offers optimal length compensation with the elevation stepped in approx. 3-5º. The weight allowance of the legrest is 60kg in accordance to ISO standard. Brake and Brake extension – Brake application is improved by increased brake lever length. The brake handle can be easily folded for side transfers. Foot plates – The rigid foot supports are ISO approved. Available in 2 versions; fixed foot support or an angle and depth adjustable option, with 5cm depth infinite angle adjustment. Only the fixed foot support version available in Australia. Both versions available in Asia and New Zealand. Backrest types – on top of the fixed backrest (0° - 7°) Action 3 also offers folding and adjustable (-6° to +24°). Folding and adjustable available in Asia and New Zealand.